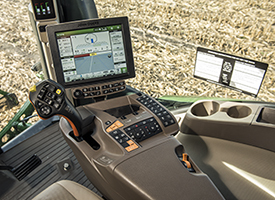 When operators first enter the Command View III cab, they will notice that significant changes have been made. Key sprayer controls are more easily accessible to the operator on the redesigned CommandARM™ control panel and the multifunction handle has a more ergonomic fit and feel. The multifunction handle has six reconfigurable buttons, a scroll to select speed range, and allows operators to better manage their headlands with the Headland Management System (HMS™) button. To finish out the upgrades, the GreenStar™ display has been upgraded to a faster, more user-friendly 4600 CommandCenter™ display, which allows operators to efficiently capture, manage, and transfer data. Comfort continues to be enhanced by the ComfortCommand™ seat, which offers both fore-aft and lateral attenuation along with 15 degrees of right-hand seat swivel on all cab options. For first-class comfort, the premium cab offers a heated/ventilated leather seat and light-emitting diode (LED) cab lights. 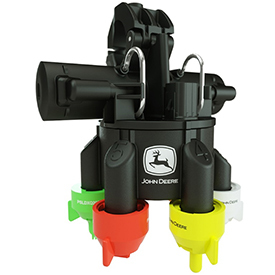 The 4 Series Sprayers are JDLink™ telematics system capable, which enable features such as John Deere Wireless Data Transfer (WDT), Service ADVISOR™ Remote diagnostics, and Remote Display Access (RDA). These integrated solutions enable additional uptime and reduce cost of operation. 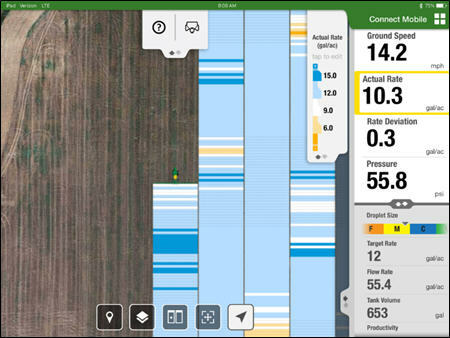 All of the CommandView III cab features allow operators to run longer hours, increasing the ability to get more acres sprayed in a day. Make fewer passes through the field and reduce compaction, as well as time spent spraying, with the optional 36.6 m (120 ft) boom. All 27.4-m (90-ft), 30.5-m (100-ft), and 36.6-m (120-ft) booms are more stable thanks to the swing link suspension, which helps translate rough areas in the field into horizontal (side-to-side) movement of the boom rather than lateral (up and down) movement. This additional stability means increased productivity as the boom now has the ability to more accurately maintain spray height above the crop, delivering a precise spray pattern. The swing link suspension also translates into uptime as the additional stability means less crop damage, resulting in less mechanical boom damage. Finally, the enhanced design allows the boom to unfold and fold faster, getting the operators into the field more quickly, and the flat fold design delivers superior transport visibility. Efficiency and productivity are key drivers to any successful application operation. To meet this need, the R4038 and R4045 have increased spray and transport speeds allowing operators to get jobs done faster and move onto the next field sooner. 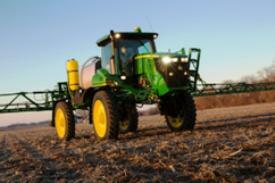 Operators can now travel 25 percent faster across the field, allowing them to spray more acres per day. Transport speed has also been increased by 16.5 percent, which gets operators to the next field quicker. This translates into 40-km/h (25-mph) spray speed and 56-km/h (35-mph) road transport speed, boosting overall productivity throughout the day. 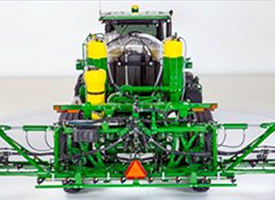 The John Deere 4 Series Sprayers have been designed to address the trend toward increased application rates and the desire for improved loading efficiencies. 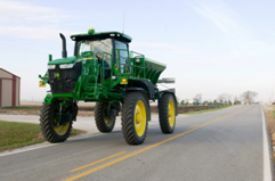 In fact, the R4030 and R4038 offer the most efficient liquid fertilizer application systems and the fastest loading times that John Deere has ever offered on this size of sprayers to date. The solution system has been redesigned from the ground up to streamline plumbing for maximum efficiency and flow rate. The standard-flow system (standard solution pump and single flow meter) delivers 30 percent higher flow rates than previous models, delivering up to 170 gal. of output per minute. The optional high-flow system, only offered on the R4038, comes complete with a high-flow pump and dual-flow meters, delivers up to a 60 percent increase from previous models, equating to approximately 225 gal. of output per minute. Additionally, load times using the on-board solution pump are up to 30 percent faster. This means operators can get back into the field sooner and spend less time filling. These improvements to the plumbing system all link to enhanced versatility and productivity for operators as they strive to increase the effectiveness of their application passes and drive towards increased yields year over year. Machine performance and operator comfort are requirements during long days of operation. The field-proven dual strut independent wheel air-ride suspension reduces overall machine maintenance. This suspension also provides a best-in-class ride, which is expected from John Deere Sprayers, even in the roughest fields. Additionally, approximately 9 percent of the machine weight has been transferred to the front axle of the R4030, R4038, and R4044, which leads to improved balance and further increases machine maneuverability. 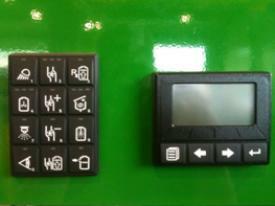 These features lead to less operator adjustment in the field and on the road. At the end of the day, a smooth, stable ride allows the operator the ability to travel faster across the field and cover more acres, leading to increased productivity. At the end of the spraying season operators can keep their sprayers working for them by converting them to dry nutrient applicators with the addition of the New Leader® DN456 Dry Spinner Spreader. This conversion can be completed in as little as 4 hours and involves the removal of the wet solution skid and the installation of the dry spinner spreader. The DN456 features a carrying capacity of up 5.6 m3 (200 cu ft) of dry fertilizer. Capable of holding 6.6 tons of fertilizer (not approved for ag lime) with variable rate applications from 34 kg/ha (75 lb/acre) up to 3 ton/acre. The 1.83-m (72-in.) spinner heights allow spread width up to 32 m (105 ft) as it propels material across the pass. This equates to a consistent spread pattern across the field and decreased cost of operation for the 4 Series Sprayers. The DN456 can be ordered with either 304 stainless-steel or 409 painted spreader material, single or dual product bin configuration, with either #4 belt over chain or #5 straight belt conveyor configurations. New Leader is a registered trademark of Highway Equipment Company. The system also features a micro-display, which provides real-time feedback on the system operations, as well as the ability to select a rinse method and the ability to monitor progress during the automated rinse function. Overall, the enhanced Solution Command System increases operational performance by increasing ease of use through automation at the load station. As solution tank mixes become more complex, operators need a better way to manage the products they are mixing in helping to reduce the risk of chemical residue. The integrated direct-injection system provides an additional carrying capacity of up to 511 L (135 gal.) on model year 2015 and older R4030/R4038 (serial number 10,999 and lower) machines and up to 889 L (235 gal.) on the model year 2016 and newer R4030/R4038 (serial number 11,001 and higher) and all model year R4045 machines for raw chemicals and allows injection of single, dual, or triple products directly into the boom depending on installed configuration. NOTE: Low-volume tanks and pumps must be configured with at least one high-volume tank and pump. High-volume tank and pump can be configured by itself. Not only can this help provide quicker changeovers and faster cleanouts, it also helps lower the risk of using multiple chemicals. This is accomplished by allowing operators the ability to isolate higher-residual risk chemicals in the injection system while mixing lower-risk chemicals in the solution tank. Direct injection can help expand the versatility that an operator has throughout the day while adding additional performance and uptime as they manage the product that they are applying. Model year 2017 direct-injection systems (attachments BKK10302, BKK10303, BKK10304, BKK10305) will have pump rinse functionality added. Pump rinse functionality can also be added to a current direct-injection system by adding a three-way inlet valve to each DI pump. The three-way valve connects on one port to the chemical tank for normal operation (injection) and to the clean water rinse tank on the other port (for daily pump rinse). 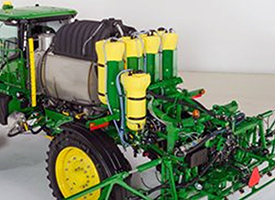 With ExactApply nozzle control, sprayer operators will see an increase in productivity and spray speed ranges, will be able to better manage drift, and will have improved spray quality and precision. NOTE: ExactApply will be available as a factory-installed option on R4030, R4038, R4045, and R4060 Sprayers with stainless-steel plumbing and 38.1- or 50.8-cm (15- or 20-in.) nozzle spacing. *Available for Australia and New Zealand in May 2017.